In 2016 WMEAC worked with Grand Valley State University (GVSU) Hospitality and Tourism Management Program, Ottawa County Parks (OCP), Lower Grand River Organization of Watersheds, and the Grand Haven Convention and Visitors Bureau on a project funded by Michigan Coastal Zone Management Program, Office of the Great Lakes, Department of Environmental Quality and the National Oceanic and Atmospheric Administration to draft a Lower Grand River Water Trail improvement plan in Ottawa County. The project will work to link the Grand River Heritage Trail with other recreational trails from Ionia to Grand Haven with a goal of achieving a National Water Trails designation and integrating with the larger Lake Michigan Water Trail. Ottawa County Parks launched the Grand River Heritage Trail in 2012. This locally designated water trail traverses nearly 44 miles of the Lower Grand River, through its length in Ottawa County, to the river mouth at Lake Michigan. The current water trail has 18 access points, 3 of which include universally accessible launches, and it highlights 60 cultural and historical features along the trail. However, since the implementation of this water trail, little is known about its actual usage. Water trails are designated routes on navigable waterways such as rivers, lakes, and canals that are designed and implemented to foster an educational and recreational experience. They provide safe access to and information about waterways while also providing connections to cultural, historical and other attractions. They are intended for non-motorized uses such as kayaks; other users depend on the character and conditions of each water trail. Water Trails contribute to local communities by stimulating local economies and expanding interest in the protection of these globally-unique freshwater resources. There are existing trails at various locations on the Great Lakes, as well as on inland waterways in Michigan and neighboring states. Some of these are well established, such as the section of Lake Michigan near Sleeping Bear Dunes in Northwest Michigan and the Pictured Rocks area of Lake Superior in the Upper Peninsula, but others have insufficient access points, signage, and amenities. This research project is funded by the Michigan Department of Environmental Quality Coastal Zone Management Program. 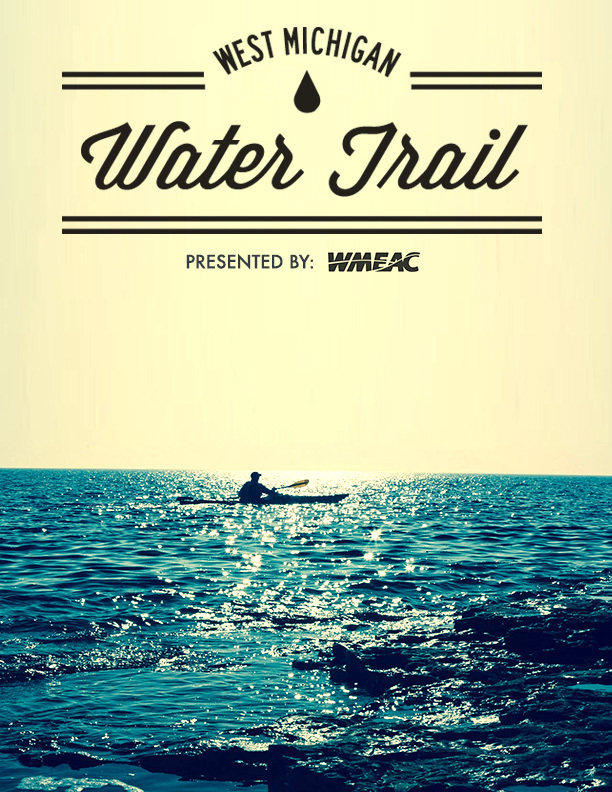 The West Michigan Water Trail initiative is complementary to a series of similar DEQ-funded projects occurring along the length of the Lake Michigan shoreline this year that will document inland and lakeshore assets for the water trail. For instance, the West Michigan Shoreline Regional Development Commission is surveying potential Lake Michigan access points on inland lakes and streams throughout Muskegon, Oceana, Mason, and northern Ottawa counties. This project is unique in that it seeks to gather information from a larger constituent, broadening the continuity of the water trails initiative to include inland sites such as lodging, camping, restaurants and convenience stores. In addition to mapping weather and climactic data, access locations, points of interest and other assets, this research project seeks input from the lakeshore communities. Input is vital in order to be able to develop the plan and gauge the level of community interest. Recognizing that watersports are not only communal and athletic but also commercial endeavors–that paddlers are also patrons–is vital to anticipating and monitoring the ripple effects of geotourism. This initiative hopes to illustrate the current state of non-motorized activity in the Great Lakes and propel management of ongoing use in a way that is environmentally and economically responsible.